Students pull a mock ball and chain representing student debt before a presidential debate at Washington University in St. Louis last fall. The U.S. provides significant subsidies to students who wish to pursue a college education. Numerous studies have found that this is a wise investment both in terms of social factors and economic growth. But that investment doesn’t pay off for everyone: Roughly one out of every six student loans is expected to default over its lifetime, a situation that can create long-term financial problems for borrowers while leaving taxpayers on the hook for what amounts to billions of dollars in bad loans. In recent years, the public debate over student debt has often focused on the roles of the students who are borrowing the money and the government policies that encourage that borrowing. But there is also another key element of the equation: the colleges themselves. Colleges and universities benefit from the federal student debt system, which lets far more students afford tuition than otherwise could. 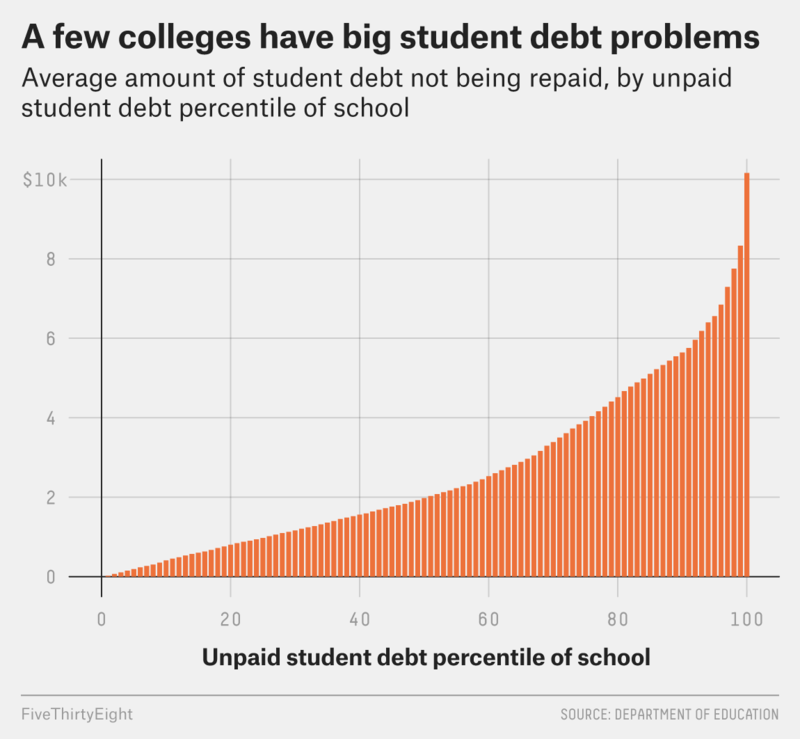 But they shoulder none of the financial risk that comes with that debt; they get paid just as much regardless of whether students pay off their loans on time. In the most extreme examples, these misaligned incentives have led to outright fraud and other bad behavior by some schools. Corinthian Colleges, one of the biggest players in for-profit higher education, shut down in 2015 amid allegations it had misled students and the government about its students’ graduation rates and employment prospects. Another big, for-profit college, ITT Technical Institute, closed its doors last year after similar allegations. The real issue, though, isn’t outright fraud — it’s that colleges are partially insulated from basic market forces, and they behave accordingly. They have financial incentives to enroll as many students as possible, and little incentive — or at least, little direct financial incentive — to ensure that those students will graduate on time and find jobs that pay well enough to repay their loans. The issue is particularly acute at less selective institutions including, but not limited to, for-profit colleges. One proposed reform to the student loan system that has bipartisan support is known as risk-sharing. In its simplest form, a risk-sharing system would directly tie an institution’s finances to the outcomes of its students. For instance, institutions could be subject to a penalty of 5 percent of the loans taken out by students who are later unable to repay their loans. Such a system would be a dramatic departure to the current federal accountability system, which has poorly designed incentives and makes it easy for schools to avoid penalties. Let me be clear: The average student receives a massive lifetime financial return from earning a college degree. This is true even when you account for the different earnings potentials between majors and varying skills/qualifications among students; it’s true even when you look just at students who take on substantial debt, and it’s true even when you consider that graduating is far from a certainty. Finally, there is even a large return for students who perform poorly in their classes (so long as they graduate). In other words, having student loans totaling $30,000 (the national average) and a college degree at age 22 is a much better situation (on average) than forgoing college and deciding to enter the labor market at age 18. But college, like any investment, involves risk — and that risk doesn’t pay off for everyone. Roughly three out of every five individuals nationally are not making any progress paying down the principal balance of their student loans three years after they leave school (the numbers improve a bit in later years, but are still strikingly high). And because student loans are usually not dischargeable in bankruptcy, this particular form of debt can follow people for the rest of their lives, even resulting in the garnishment of Social Security checks. There are steps that schools can take to help their students avoid getting into trouble with their debt. They can eliminate unnecessary requirements in order to help students graduate more quickly and thus avoid taking on as much debt; many “two-year” degrees, for example, require more than two year’s worth of classes. They can invest in internships with local business partners so that students have an easier time getting well-paying jobs after graduation. Perhaps most significantly, schools can focus on helping students complete their degrees. The students who are most likely to get into trouble with debt are the ones who don’t graduate, and there are a lot of them: Only 60 percent of bachelor’s degree students earn a degree within six years, and just 39 percent of associate-degree students do so. There is evidence that colleges can boost graduation rates when they make it a priority. Georgia State University in Atlanta, for example, improved its graduation rate by an astonishing 22 percentage points over a 10-year period by implementing reforms such as a tracking system that uses historical data to identify students who are at risk of dropping out so that the university can intervene and provide help. The problem is that not all schools are taking these steps, and it shows up in the data. The chart below shows the average amount of debt that isn’t being repaid three years after students leave school.1 The distribution is highly skewed: A relative handful of schools account for a disproportionate share of the debt problem. Under a risk-sharing system, these schools would face the steepest penalties and would be forced to find ways to address their deficiencies as a result. These problem schools are disproportionately for-profit institutions, as the table below shows. But the same logic applies to public and nonprofit institutions, as well — and there are poor-performing institutions in every sector, not just for-profits. Different institutions, of course, face different challenges. One of the advantages to risk-sharing is that it doesn’t prescribe specific solutions — it just gives schools an incentive to figure out the solutions that best fit their needs. A well-designed risk-sharing program should be simple and straightforward in order to provide clear incentives for institutions and reduce the likelihood of “gaming” behavior in which schools invest more effort into avoiding penalties than investing in students. It is also important not to put all of the blame for these differences solely on the schools; factors under a school’s control are not responsible for every, or even most, subsequent bad financial outcomes students might face. There are vast differences in the resources available and type/preparedness of students at each institution (although disparities persist after controlling for these factors). Thus most proposed risk-sharing policies would hold schools accountable for only a small part of the cost of defaults, perhaps 5 percent. As with any policy change, there are potential drawbacks to a risk-sharing policy. First, it could put upward pressure on already high tuition rates as schools seek to recoup their losses from the new penalties. However, in a recent paper I found that for most reasonable penalty rates this is not much of a concern. Second, risk-sharing could lead to schools credit-rating students during the admissions process. In other words, institutions might be less likely to admit students they perceive to have a higher likelihood of being unable to repay their loans. This is a more serious worry, and needs to be addressed in any new law, perhaps by providing financial incentives to schools for each at-risk student who successfully repays their student loan. We may soon get the chance to see how these policies work in practice: Congress is likely to consider some form of risk-sharing when it takes up reauthorization of the Higher Education Act in the near future. If it enacts such a policy, and if it works, it could be a boon to both government finances and improve outcomes for individual students. “Not being repaid” means borrowers have made no progress on the principle balance. Schools are grouped into percentiles.